Originally from Yorkshire England, the Australian Yorkshires were derived from the original English breed of domesticated pig. This particular breed is also known as the most common breed in Australia. 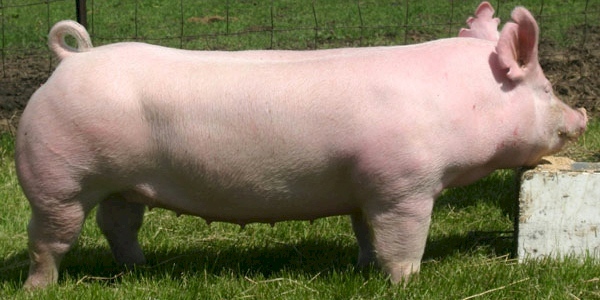 In 2001, a study was conducted at the Institute of Agricultural Sciences of South Vietnam that compared the Australian Yorkshire and the Duroc to common Vietnamese pigs. It concluded that the Australian breeds had a significant advantage over Vietnamese breeds in growth efficiency, and in littering performance. The Australian Yorkshire is marketed globally, with special modifications being made for Asian markets. For example, Australian Yorkshires supplied by Australian Pork Limited was opened to specifically change the diet of the pigs to please consumers in Singapore. The pigs sold in Singapore were fed barley, grains, and soy beans, rather than whey powder, as the whey powder gave the meat a milky taste that was not well received.